​Renee Simmons Raney grew up on a farm near Choccolocco, Ala., where she learned about the wonders of nature. Ever since, she’s dedicated her life to educating people about nature in unique ways. How did your upbringing influence your career? I was blessed to grow up on my grandfather’s dairy farm nestled in the valley just between the Choccolocco Mountains and the Cheaha Mountain range. My family encouraged me to be creative and to respect even the tiniest portions of the natural world. My imagination had no boundaries. I thought all children had this experience until I started school and realized that many children lacked the opportunity for outdoor play. As I grew up and began my career in environmental education, my passion for merging science with art and creative play became my mission. Most people lose touch with the enchantment of youth, but I never did! I still live on a corner of that farm with my husband, my son, four happy dogs, 10 content chickens and a few hives of joyful honeybees. How did your interest in fairies, folklore and storytelling transfer over into your career?Albert Einstein said, “If you want your children to be intelligent, read them fairy tales.” I believe every moment in nature is a “Once Upon a Time” moment. I have spent many years working with inner city and underserved youth in Alabama. Most of these children don’t have opportunities to connect with the natural world. When we take them to national parks or forests, they are terrified. Once I have shared my natural history fairy tale stories, explained that they can pretend to be the size of their pinky finger and allow them to create their own nature home or fairy house, they become comfortably fearless. The insects and creepy things are no longer enemies. In my book, I share my fairy stories from childhood through present day. I include lists of activities for each chapter to make it easy for parents and grandparents to play outside with their young folks. I have developed an “enchanted curriculum” for teachers to use these techniques to teach science, math, literature, physics and other topics. After reading my first book, Calico Ghosts, Alabama’s own Kathryn Tucker Windham handed me her old black click pen and said, “Take my pen and continue to inspire imagination across the South.” It was an epic moment in my life! People say you have a unique way of presenting your environmental education programs. How is that? I merge my skills as a biologist and anthropologist with my passion for creative drama and storytelling to create exceptional experiential place-based education programs for vast audiences. I’ve watched the magical joy spread across a child’s face when she holds her first glob of frog eggs in her hands and witnessed an 80-year-old man transform into a mesmerized 8-year-old as he listens to stories about farms and wild places not forgotten. I use live animals, or “creature teachers,” in most of my programs. I am part of the “No Child Left Inside” movement. A few years ago, Dr. Richard Louv wrote a book called Last Child in the Woods in which he coined the phrase “Nature Deficit Disorder.” Louv believed that the lack of outdoor play in childhood is causing a great disconnect between a generation of young people and the natural world. We know that 30 minutes a day spent outside can reduce stress, lower blood pressure, increase mental productivity and bring pleasure. What are your goals for your new job at Cheaha State Park? ​It is my goal to provide unique environmental education, cultural heritage and nature art programs for diverse audiences of all backgrounds and ages. I want everyone to ascend the cloud-shrouded mountain and discover Cheaha State Park, which we often refer to as “the island in the sky!” Our team is developing several programs such as a permanent “Fairy Trail” where families can create small structures from all natural materials while using their creativity to connect with nature. Learn more about Renee Simmons Raney or order her books at www.reneeraney.com. Tour of Canada from Vancouver to Calgary and on to Toronto! A great week of Fairy Houses, Stories, Fairy Fundannas! Built fairy houses with families from 9 different nations! One hundred fourth graders gathered at Saks Elementary School's outdoor amphitheater to hear Renee Raney tell her farm, fairy, and forest stories. The children sat mesmerized as they learned of unique ways to play outside and learn more about nature. 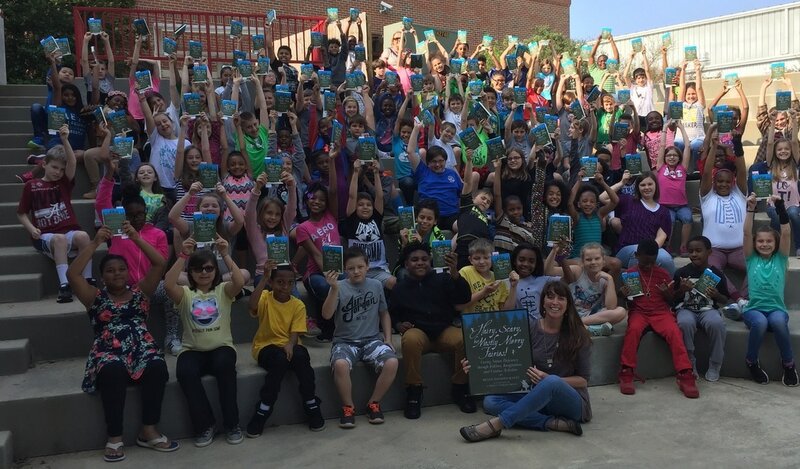 The group burst into applause when Raney told them that through the generosity of Wells Fargo through a grant by the Georgia-Alabama Land Trust they would each receive a copy of her new book, Hairy, Scary, but Mostly Merry Fairies to share with their families! Students from Munford Elementary enjoyed a USFS Classroom in the Forest on April 14th There were stations about timber management, wildfire, water quality, and the "Land & Literacy" station! Parents, grandparents, teachers, and students learned how important it is to play outside and connect with nature, they met Ms. Renee's live snakes, and 110 students received the Hairy, Scary, but Mostly Merry Fairies: Curing Nature Deficit Disorder through Imagination, Folklore and Creative Activities (teachers received three books: HSMMF, Vitamin N, and Last Child in the Woods). All were MUCH appreciative of Wells Fargo and Georgia-Alabama Land Trust's funding this program. The Georgia-Alabama Land Trust's Conservation Education Institute was recently awarded a grant from Wells Fargo to support a program titled "Land & Literacy: Curing Nature Deficit Disorder in Children and Families." This project will focus on Central and Northeast Alabama school programs, field trips, and summer workshops to provide nature-based science supported arts and literacy programs such as art activities, live animal programs, nature journaling, hikes, and more! Books such as Richard Louv's "Last Child in the Woods" and "Vitamin N," and Renee Simmons Raney's new book, "Hairy, Scary, but Mostly Merry Fairies: Curing Nature Deficiency through Imagination, Folklore, and Creative Activity" will be provided to 250 students, families, and teachers to encourage environmental literacy, expand creativity, and instill conservation ethics. This experiential nature literacy program supports Raney's philosphy that "Every moment in nature is a once upon a time moment." "New book by local educator tells of fairies and the magic of nature"
"Recognized by the Oxford University Round Table, chosen as WildSouth's Educator of the Year, nominated for American Recreation Coalition Programmatic Award, Renee Raney brings science, art, and EE to people of all ages through unique and enchanting methods. She is a wunderkind who speaks the ancient language of nature." Last weekend (February 24, 2017) at the Environmental Education Association of Alabama's annual fundraising live auction, all were amazed when a photo of Author Renee Raney reclining with one of her books popped onto the giant "merchandise" screen. The auctioneer began the bid at $100 and soon there was a frenzy of bidding from various regions of the state, as well as from he keynote speaker, Jordan Fisher Smith, from California! When the last bid was called, Ruffner Mountain Nature Center "won" a storytelling-fairy houses and book package (delivered by Renee) worth $800 and EEAA received a nice donation toward their scholarship program. Fairies and storytelling "Raney style" were popular at the Southeastern Environmental Education Association hosted by the Georgia Environmental Education Alliance last week (March 3-5, 2017). ​"It brings me great joy to have the support of my peers," says Renee Raney as she signs her new book during her "Nature Observation through Fairy Houses" workshop.